To fix this error, find the Course Menu Icon in the top left corner of the page to see the content of your course. Select the page that you want to be the course entry point, such as the home page. If the page is hidden, it will have a small box with a black line through next to the page name. If the Page has no content, there will be a small box next to the page name. To show a hidden page, click the gray arrow next to the page name. On the drop down menu, select “Show Link”. 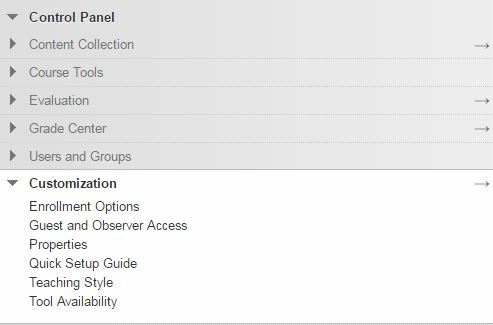 Next, under Control Panel, select “Customization” and find “Teaching Style” in the drop down menu. This will take you to a settings screen. Find the “Select Course Entry Point” drop down box and select the page you want to be the Course Entry Point. Note: the drop down box will only contain pages that are unhidden or have content.